There are things we can do to find favor! Vines says, “favor” can be deserved or gained. As we see from the text Ruth’s pursuit of favor began early in the morning. She had a goal to reap grain in the field of the one she found favor. She quickly found favor and reaped grain in Boaz’s field. Previously, we noted “favor” may be deserved or gained and it appears Boaz believed Ruth deserved favor because of her loyalty to Naomi. He spoke a blessing over Ruth, in Ruth 2:11-12, “ It hath fully been shewed me, all that thou hast done unto thy mother- in- law since the death of thine husband: and how thou hast left thy father and thy mother, and the land of thy nativity, and art come unto a people which thou knewest not heretofore." In verse 12 Boaz speaks of recompense and a full reward. He wants the Lord to recompense her, that is to prosper her or repay her for taking care of her mother- in- law. She could have returned to her mother and father in Moab; She could have sought to marry a young man her own age whether rich or poor as noted by Boaz himself. But in the valley of decision when she had the opportunity to turn back with Orpah, she decided to remain with her mother-in-law until parted by death. She would not allow her aged mother-in-law to travel 120 miles alone. Could she cross the Jordan River safely alone? She could not imagine her mother-in-law attempting to make the treacherous journey alone. They would do it together or die together. Boaz saw the sacrifices Ruth made and called upon God to reward her. He used two distinct words “recompense” and “full reward." He wanted God to recompense Ruth, that is repay her for “works” or “good deeds” she performed on Naomi’s behalf. He also wanted God to give her a full reward for rejecting the false gods of Moab and coming to trust in the Him, the Great I Am. Vander Klok notes coming to accept Jesus Christ as Lord and Savior is the first step required to receive God’s favor. Salvation is a gift. We can’t work for it. We can’t earn it but there is another level of favor that is earned and hence is the way we reach our goals and dreams in life. Operating on this level of favor will get us a job promotion or that high paying client we long to serve. Our children will rise and call us blessed. Joy and peace will reign in our marriages. This level of favor is based on the choices we make in life. Ruth chose to be “faithful, loyal, polite, humble and a hard worker.” Most importantly Ruth chose to come under the wings of the Most High God. 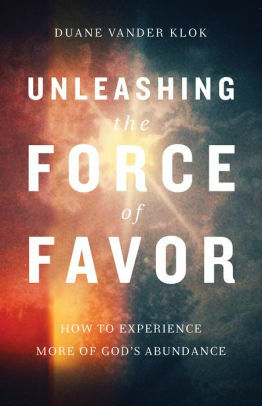 I wonder where God’s gracious favor take us when we decide to be “Favor” Chasers! To learn more about Duane Vander Klok please visit the following links. Sit Walk Stand is derived from the book of Ephesians, chapters 1, 4 and 6. It was written by Watchman Nee a Chinese Christian author, preacher and teacher. Nee was born in 1903 and died in prison for his faith in 1972. He builds the frame and content of the book upon key words or phrases from the text, Specifically, our Position in Christ (Sit), Our Life in Christ (Walk) and our Attitude to the Enemy (Stand). Have you been wronged by a neighbor, friend, co-worker, or family member? Have you thought about taking revenge? Have you thought about your rights in the situation? Do you feel as if your rights were violated? Such a response is normal but improper. Nee notes as Christians our standard can never be right or wrong but the cross. The cross is our standard if we have been wronged our response should be based on grace and love. By doing so we will be conformed to Christ’s image and an unsaved offender may be drawn to Christ or an estranged relationship may be restored. Nee believes the act of demanding our rights will cause us to fail the test of “walking” that is living a life that is pleasing to God. The act of standing is an action that guarantees victory over Satan. Nee notes our task is one of holding not attacking. We don’t need to fight to obtain the victory. We are only to hold on to it against all challengers. Nee says, the word stand implies that the ground disputed by the enemy is really God’s and therefore ours. He notes the difference between defensive and offensive warfare. Defensive warfare says I’ve got the ground and I am seeking to keep it. Offensive warfare says, I don’t have the ground and I am fighting in order to get it. Nee appears to promote the idea that we are engaged in defensive warfare more than offensive warfare. Yes, God has given us the promise of victory over Satan and opposing forces. However, I contend although He may give us a promise in many cases the “object” of the promise whether it is the promise of Salvation, or material provision or spiritual gifts, they are only obtained by God’s power as we “attack” opposing forces via faith. For example, we may have to attack doubt and unbelief before accepting the gift of God’s precious son which leads to Salvation. As God and mankind work together in a battle against the kingdom of darkness; overcoming the kingdom of darkness involves defensive and offensive warfare. And offensive warfare appears to be the norm. Paul visited various cities preaching the gospel “attacking” unseen spiritual forces in an idolatrous world. Jesus came to destroy the works of the devil…He went throughout Satan’s kingdom casting out devils, healing the sick, raising the dead and opening blind eyes. This appears to be offensive warfare. He advised the people that at one point Satan’s kingdom was secure but now one stronger than Satan had come. The stronger one was ready and able to spoil Satan’s goods that is deliver the souls of men from his power! If the theory is “if I fight I win, because Christ has given me the victory; Nee’s perception gives me hope for the battle. Watchman Nee died on May 30, 1972 but his books are available for purchase wherever books are sold.